"All I know about my Welsh ancestry is that after the battle of Waterloo and after the little Corsican had been safely housed at St. Helena, when England was no longer in need of Welsh protection, my grandfather, Sampson Vaughan, having some leisure, married Mary Jones, a worthy compatriot, and came to America on his honeymoon. He bought a scrub oak farm, which I have no doubt he called an estate, near Durham, North Carolina, and with the aid of some negroes, spent the remainder of his days in cultivating that weed which was introduced into England by Sir Walter Raleigh. My father, John Vaughan, it appears, grew tired of hoeing tobacco; and working with an uncle in Durham became quite an expert cabinet maker. Later, wishing to see something of the fabulous West, he enlisted in the quartermaster's department of the United States Army and did his bit in the construction of Forts Laramie and Kearney." John Vaughan was born on 10 March 1823 in NC. He married Eliza Adeline Dameron , daughter of William Moore Dameron and Elizabeth Ingram Dameron , on 9 July 1850 in Randolph Co., MO. He died on 27 October 1893 in Randolph Co., MO, at age 70. He was buried in Smith Burying Ground/Cemetery, Randolph Co., MO. Eliza Adeline Dameron was born on 15 April 1830 in Caswell Co., NC. She and John Vaughan appeared on the census of 1850 in Randolph Co., MO. She married John Vaughan on 9 July 1850 in Randolph Co., MO. 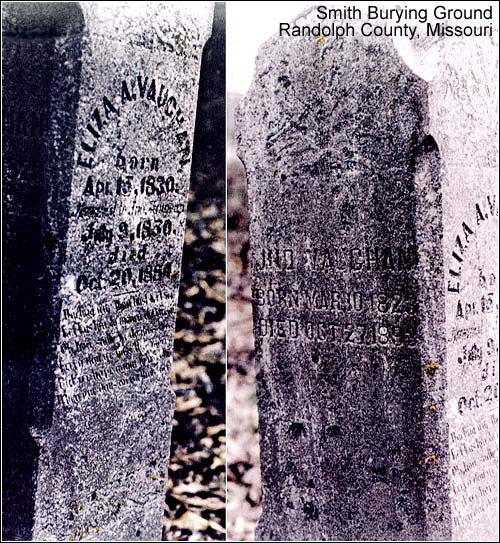 She died on 20 October 1884 in Randolph Co., MO, at age 54. She was buried after 20 October 1884 in Smith Burying Ground/Cemetery, Randolph County. Through Eliza Dameron, the Vaughans are linked to French Huguenots and Crusaders, to George Washington, and even to the famous orator, Henry Clay. Victor Clarence Vaughan was a physician, Dean of the University of Michigan Medical School, and President of the American Medical Association. He was born on 27 October 1851 in Randolph Co., MO. He married Dora Catherine Taylor on 16 August 1877 in Randolph Co., MO. He died on 21 November 1929 in Richmond, (Henrico Co.), VA, at age 78.